If lots of your OneDrive files get deleted, overwritten, corrupted, or infected by malware, you can restore your entire OneDrive to a previous time. 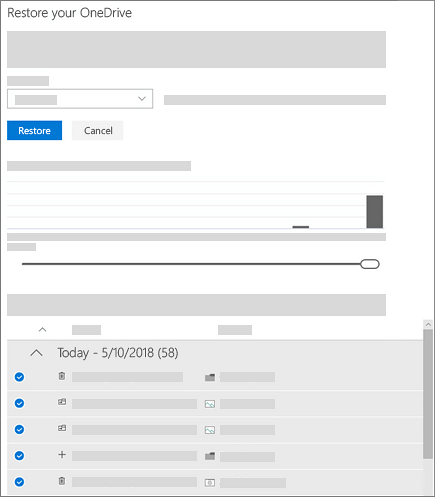 Files Restore helps Office 365 subscribers undo all the actions that occurred on both files and folders within the last 30 days. If you don't subscribe to Office 365 or you want to correct issues with individual files one at a time, you can restore deleted files from the OneDrive recycle bin or restore a previous version of a file. Note: The video shows a OneDrive personal account. When you're signed in with a work or school account, select Settings > Restore your OneDrive to get started. If you're signed in with a personal account, at the top of the page, select Settings > Options, and then select Restore your OneDrive from the left navigation. If you're signed in with a work or school account, select Settings > Restore your OneDrive. Note: The Restore your OneDrive option isn't available in the classic experience of OneDrive for Business or without an Office 365 subscription. Use the activity chart and activity feed to review the recent activities that you want to undo. The daily activity chart shows the volume of file activities in each day for the last 30 days. It gives you an overview of what has happened to your OneDrive over time and can help you identify any unusual activities, such as when your OneDrive was infected by malware. The activity feed shows individual file and folder operations in reverse chronological order. You can scroll down to see previous days, or move the slider below the daily activity chart to quickly move to a specific day. Tip: Use the expand and collapse arrow next to each day in the activity feed to show or hide activities for that day. If you're selecting a custom date and time, select the earliest activity that you want to undo. When you select an activity, all other activities that occurred after that are selected automatically. Note: As you pick a day in the activity chart, you hide more recent activities in the feed, but those more recent activities will still be selected if you select an activity. Before you click Restore, scroll to the top of the activity feed to review all the activities you are about to undo. When you’re ready to restore your OneDrive, click Restore to undo all the activities you selected. Your OneDrive will be restored to the state it was in before the first activity you selected. If you change your mind about the restore you just did, you can undo the restore by running Files Restore again and selecting the restore action you just did. Files Restore uses version history and the recycle bin to restore OneDrive, so it's subject to the same restrictions as those features. When version history is turned off, Files Restore won’t be able to restore files to a previous version. For information about versioning settings, see Enable and configure versioning for a list or library. Deleted files can’t be restored after they’ve been removed from the site collection recycle bin—either by manual delete or by emptying the recycle bin. If you upload a file or folder again after deleting it, Files Restore will skip the restore operation for that file or folder. If some files or folders cannot be restored, a log file will be generated at the root folder of your OneDrive to capture the errors. The name of the file begins with "RestoreLog" followed by an ID (for example, RestoreLog-e8b977ee-e059-454d-8117-569b380eed67.log). You can share the log file with our support team to troubleshoot any issues that may occur.